Heron Landing is one of the residential developments spurred onwards by Sarasota County’s 2050 growth plan, one component of which encourages new communities to be built east of Interstate 75. A development of the publicly traded company Meritage Homes, this community is conveniently located on the northwest quadrant of Clark Road and Proctor Road less than two miles east of the interstate highway. Besides the ideal location of Heron Landing, it also shares this area with some prestigious neighborhoods including popular golf communities. These include Red Hawk Reserve, Misty Creek, Heritage Oaks and Bent Tree, all of which are well-established developments that typically have sizable listings of pre-owned Sarasota homes for sale. 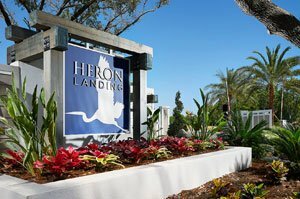 Heron Landing is set as a gated community with 90 home sites. These are all oversized lots providing either lake or preserve views and are suitable for residences built with their own private pools and customized outdoor living areas. This large plats make a clubhouse and community pool dismissible for this development, which consequently lowers the HOA fees that residents pay. As a common facility, a walking trail is one natural element for this community carved out of the open spaces of the former cattle ranch countryside east of Interstate 75. Meritage, which boasts of award-winning residential designs, offers seven floor plans of Heron Landing homes for sale with choices in one- or two-story builds. This Scottsdale, Arizona-based builder showcased one of these plans at the 2018 Sarasota Manatee Parade of Homes as its market ice-breaker for Heron Landing. 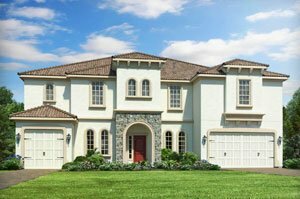 One of Meritage’s entries in this annual showcase of local Building Industry Association is the Ashton II floor plan at Heron Landing. This one-story model’s floor space measures 3,308 square feet, featuring four bedrooms, three full baths and a half-bath. Built with a three-car garage, this home is priced starting from the upper $500s. 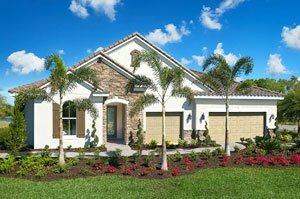 The largest floor plan that Meritage offers in Heron Landing is its two-story Tortuga design with a floor area of up to 5,178 square feet good for eight bedrooms and four full baths. It also comes with a three car garage and a starting price in the high $600s. Heron Landing homes for sale flaunt aesthetics and style in their designer-approved finishes that inspire the confidence of prospective buyers. Aside from these winsome attributes, these residences also boast of energy-saving features and highly functional spaces throughout. As enticing to home hunters, Heron Landing’s location is convenient to many of Sarasota’s popular life and leisure destinations as well as the region’s top public schools. Pivotal to all these is the Clark Road corridor which provides easy access westward not only to Sarasota Middle and Ashton Elementary. This stretch is likewise a gateway to local commercial centers, healthcare facilities and the beach-based pleasures of Siesta Key on the Gulf Coast. Northwards, Interstate 75 opens to more of the region’s amenities including those in downtown Sarasota and Main Street of Lakewood Ranch. Networking and socializing is as easy too, as Heron Landing is just a short distance from country clubs offering various types of memberships, activities, and facilities enhancing the quality of life in Sarasota communities. Below are the current real estate listings available at Heron Landing.